Each month, we like to take a minute to introduce our audience to the upcoming SB2 topic and recognize why it is of importance for our community. 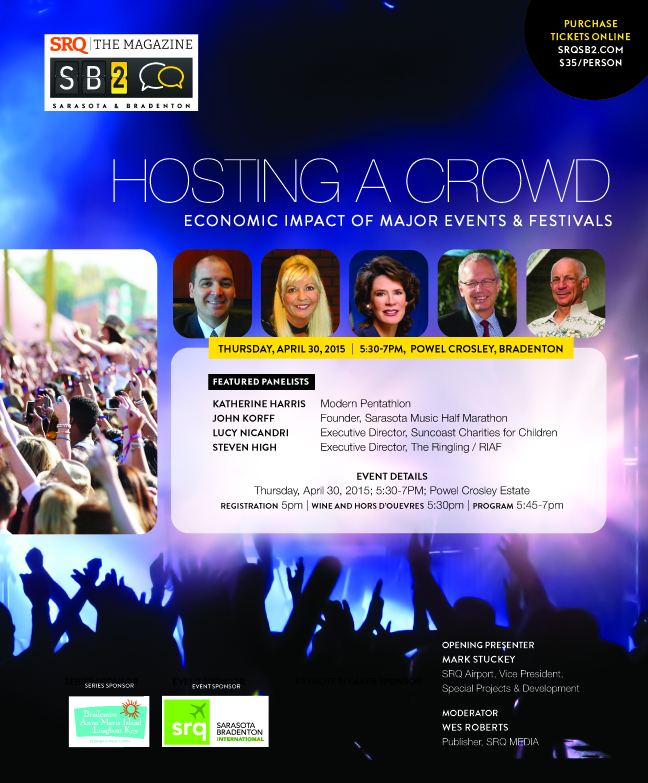 On April 30th at 5PM, you’re invited to join us for Hosting a Crowd: Economic Impact of Major Events & Festivals. We will hear from Katherine Harris of the Modern Pentathlon, John Korff, Founder of the Sarasota Music Half Marathon, Lucy Nicandri, Executive Director of Suncoast Charities for Children and Steven High of The Ringling and RIAF. 1. Know the audience. As the events we host are as different in category as the people that attend them, learn from our experts on what each particular crowd is looking for. As our major event planners and representatives will share – the organizers and participants are looking for different things (infrastructure and accommodations, to ease of access and kid-friendly options). What can we do to attract them and ensure an enjoyable experience? 2. You can reap the benefits! What are ways that local businesses and individuals can make the most of large-scale events? It only makes sense that with an influx of individuals to the region, all sectors of local business should be benefitting. We can’t wait to hear our panelists’ recommendations on marketing ourselves for repeat visits to the region. 3. Learn to prepare for the crowd. How do we, as a region, adequately prepare for large (and growing) crowds in our own backyard? Any good host wants their guests to feel at home – so how do we stack up as a destination for major events? And of course, we can’t mention why you should be at SB2 without mentioning The Powel Crosley Estate – beautiful, historic, stately…and located right on Sarasota’s gorgeous bay. We’ll enjoy cocktails, small bites and the view from 5-6PM. Panel discussion begins at 6PM followed by a question and answer period. Hosting a Crowd is sponsored by Sarasota Bradenton International Airport. The SB2 series in Bradenton is sponsored by Bradenton Area Convention and Visitors Bureau. Purchase your tickets today at www.srqsb2.com.